Every year, each of Oklahoma’s 29 technology centers is given the opportunity to recognize a business or company in its district that really stands out as a true partner. 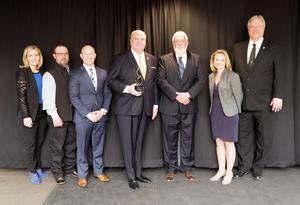 This year, Northeast Tech selected Pelco Structural of Claremore as its 2019 “Partner in Progress” for the steel pole manufacturing company’s commitment to advancing career technical education through utilization of Northeast Tech’s programs and through exemplary commitments to workforce excellence and education in the community. Northeast Tech Superintendent Fred Probis added that involving industry partners in developing training programs is a win-win for everyone.